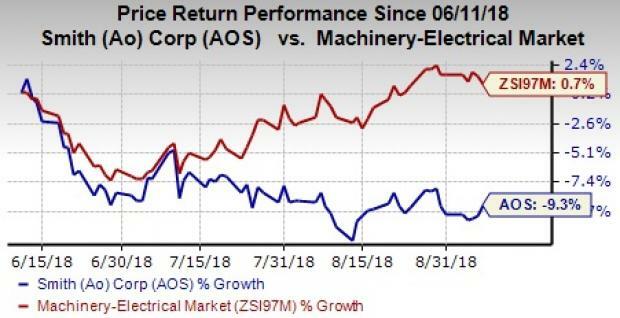 We issued a research report on A. O. Smith Corporation AOS on Sep 10. This water heating equipment maker currently has approximately $10 billion market capitalization. Presently, it carries a Zacks Rank #3 (Hold). Few growth drivers and certain headwinds, which might influence A. O. Smith, have been discussed below. Financial Performance & Bottom-Line Outlook, Earnings Estimates: A. O. Smith pulled-off a positive average earnings surprise of 4.73% for the last four quarters. This includes the impact of 6.45% earnings beat recorded in the second quarter of 2018. Further, in the reported quarter, the company’s bottom line grew 24.5% year over year on the back of robust sales growth, lower effective tax rate (due to the implementation of the U.S. Tax Cut and Jobs Act) and 1.2% decline in shares outstanding. For 2018, the company has increased its adjusted earnings per share projection from $2.55-$2.61 to $2.59-$2.63. The mid-point of the projection reflects year-over-year growth of 20%. Pricing actions taken to curb the impact of higher steel prices and inflation in other costs will be a boon. In the past 60 days, earnings estimates on the stock for 2018 have been increased by four brokerage firms and lowered by one. Currently, the Zacks Consensus Estimate for earnings is at $2.61 for 2018, reflecting growth of 0.4% from the tally 60 days ago. For 2019, the earnings estimates remained stable at $2.92. The bottom-line estimates represent year-over-year growth of 20.3% for 2018 and 11.8% for 2019. Replacement Market a Boon: Over time, A. O. Smith has been gaining from strong footholds in the replacement market, which accounts for roughly 85% of the North American water heater and boiler volumes. It’s worth noting here that new construction and higher replacement demand will boost water heater volume in the U.S. residential industry by approximately 350,000-400,000 units. Further, U.S. commercial water heater industry volumes might gain from the strong demand for electric units. Furthermore, rise in replacement demand will support growth of water heater business in China. Sales (local currency) in China are anticipated to improve 6% in the second half of 2018 versus 4% growth recorded in the first half. Shareholder-Friendly Policies: A. O. Smith believes in rewarding its shareholders handsomely through dividend payments and share buybacks. In the first half of 2018, the company used $61.8 million cash for distributing dividends and $69.7 million for repurchasing shares. It had an authorization to repurchase 1.3 million shares left, exiting second-quarter 2018. It’s worth mentioning that a new $2.5-million buyback program was announced in July. For 2018, the company anticipates repurchasing approximately $135 million worth of shares. Forex Woes, Weak Top-line Outlook: Geographical diversification is reflective of a flourishing business of A. O. Smith. A significant portfolio of the company’s revenues is generated from business operations in China, India and Europe. However, this diversity has exposed it to headwinds, arising from geopolitical issues and unfavorable movements in foreign currencies. It predicts forex woes related to unfavorable movement in Chinese currency to lower its revenues by $22 million in 2018. The top-line projection for the year has also been lowered to 9.5-10% from the earlier prediction of 10-10.75%. Surging Costs and Weak Margins: A. O. Smith is grappling with adverse impacts of rising cost of products sold and operating expenses. Cost of products sold is primarily soaring due to higher cost of raw materials, especially steel. For 2018, the company predicts rising steel prices to adversely impact its margin. On the other hand, investments for innovation, upgrading existing product line and boosting e-commerce business as well as sales expansion in Tier 2 and 3 cities in China are increasing the company’s operating expenses. Furthermore, costs to start up water treatment business at Lowe’s remain an issue. For 2018, the company expects margins of its Rest of World (including China, India and Europe) segment to be flat to down slightly on a year-over-year basis. This prediction is below 30-40 basis points growth anticipated earlier. Poor Share Price Performance and Valuation: Currently, market sentiments seem to be against A.O. Smith. Since the second-quarter 2018 results were released on Jul 25, 2018, the company’s shares have remained roughly flat, while the same has declined 9.3% in the past three months versus 0.7% growth recorded by the industry. Further, the company’s stock, when compared with the industry, appears overvalued, considering the Price-to-Earnings (P/E) multiple for the past three months. The stock’s P/E (TTM) multiple is 24.4, above the industry’s 20.1. This overvaluation somewhat makes us cautious on the stock. Some better-ranked stocks worth considering in the Zacks Industrial Products sector are Altra Industrial Motion Corp. AIMC, Chart Industries, Inc. GTLS and Barnes Group Inc. B. While Altra Industrial Motion sports a Zacks Rank #1 (Strong Buy), both Chart Industries and Barnes Group carry a Zacks Rank #2 (Buy). You can see the complete list of today’s Zacks #1 Rank stocks here. In the past 60 days, earnings estimates for each of these stocks improved for the current year and the next year. The average positive earnings surprise for the last four quarters was 4.01% for Altra Industrial Motion, 29.36% for Chart Industries and 6.88% for Barnes Group.